the the founder and executive director of the Coalition of Schools Educating Mindfully (COSEM). COSEM will be hosting its first annual conference from February 28-March 2, 2019 in St. Charles, IL (outside of Chicago). Catharine: I was interested to see that your bachelor’s degree is in Civil Engineering. What led you toward yoga and mindfulness? Tracy: My mindfulness path started when I was an engineer. When I’d get lower back pain from sitting all day with stressful deadlines, I sought out a remedy and found yoga. I never had a passion for engineering, so after 5 years, I decided to quit and start a family with my husband Gary. When that proved a challenge, I tried out different medical interventions and after a few years started down a holistic healing path with the help of our local library. That’s where I came upon a Thich Nhat Hanh book on mindfulness. Every word in it resonated and soothed me and that pretty much led to the non-stop reading of yoga and mindfulness books for about six months, starting a daily practice, and taking yoga classes a few times a week. Catharine: How were you helped by your daily practice? Tracy: Mindfulness helped me look differently at all of the unhelpful thoughts flooding my mind, zapping my zest for life and causing depression. Daily practice helped me focus less on the future and embrace more fully my imperfect, yet beautiful life. I started befriending my unknown future, even if it meant not having biological children. It was so transformative that I decided to take a month-long ashram-style yoga teacher training in Sedona, AZ in 2003. Within weeks of coming home, our 7-year journey ended with me getting pregnant naturally. Catharine: That must have been a very pleasant surprise! These days, what do you do in your personal practice, and how does it help you with your work? Tracy: My daily practice is sitting on a comfy chair and listening to the hum of the refrigerator from 6:30-7:00am, after my high schooler leaves the house and before my other kids get up. Almost every conference and coalition idea I’ve gotten has been while meditating, taking a shower, doing yoga or lying in bed doing a body scan. It feels as if I download the ideas from others rather than thinking them up myself; I get in an allowing state and most often some sort of inspiration comes, whether it’s just to drink some more water or view a ‘problem’ differently or something more grand. I then try to take action before my thinking mind starts talking me out of it. I’ve learned that when my actions are not inspired, and instead feel heavy and efforting, then they are not nearly as fruitful or enjoyable. I also take lots of breaks during the day to stretch and breath and dance. I try to savor and ‘milk’ all the satisfying feelings that arise during the day and dancing to music is a fun way to bask a bit longer in satisfaction and appreciation. Dancing is also when I feel most free, so it is a reminder that what I accomplish and “do” is not the end goal, freedom is my goal, and freedom feels most like clarity, joy and well-being to me. The “doing” path I choose is just a means for experiencing that freedom. We don’t need to save the children with mindfulness or fight against the violence and injustice we see everywhere, we just need to keep loving those we encounter, tapping into our own freedom and peace, and taking inspired action each day…and the world will transform on its own. Catharine: I love the idea of a 'mindful dancing' practice. Have you shared mindfulness and movement with your kids? As our three kids grew up, I was very proactive regarding their mental health because I had family members who struggled at times with ADD and other mental health challenges. I couldn’t help but wish I had learned mindfulness as a child. I started teaching yoga and mindfulness at my kids’ and husband’s schools every chance I got. He is Department Chair of PE and Health at a high school, and also a coach, so I had lots of access to student groups. Catharine: Why did you decide to start the Coalition of Schools Educating Mindfully? Tracy: Last school year, my kids’ school district had both an 8th and 9th grader commit suicide. In the fall, I checked in to see if they’d be up for integrating mindfulness as a proactive Tier 1 mental health strategy. They wanted to move beyond “putting out fires” and were open to suggestions. I began researching mindfulness programs and at my suggestion they started piloting Inner Explorer in a few classrooms. That made me think that there were probably thousands of other schools also researching mindfulness programs, and how great it would be if there were one spot for schools to learn about them all. Then in the spring I tried to sign up for an SEL conference in Chicago that had some mindfulness sessions, but it was sold out. I had just led a mindfulness session at a teacher institute day for districts west of Chicago, so the idea sparked for organizing a larger Mindful SEL Conference for the next year’s teacher institute day. 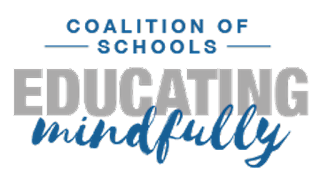 The conference idea expanded to a coalition this summer when I reached out to Barnaby Spring, Director of Mindfulness in Education at New York City Department of Education, to see if he could present at it. He brought up how impactful it would be if schools educating mindfully joined forces to support and learn from each other, and we moved forward together in our collective vision to create even greater momentum for what he calls the “emergence” of mindfulness in education. I reflected on whether I was the person to launch a coalition; I was a parent with a passion for the subject and had most of the talents needed to serve such a coalition AND I had lots of time on my hands, which educators are lacking. I trusted my intuition and brushed my thoughts of “who am I to start a coalition” aside; I researched the other mindfulness organizations and conferences and tried to create something totally unique with a Coalition Gathering at its heart; then I reached out through the Mindfulness in Education Network (MiEN) and Association for Mindfulness in Education (AME) listservs/email groups to gather a full board of directors. Catharine: In your opinion, what's unique about COSEM? Tracy: Our organization is different because of our leadership. On our planning team we have someone from every discipline of education represented, from school nurse to social worker; schools are at the lead and steering it. We also have a large advisory team of mindfulness experts, many who have been working with educators for 10-20 years. We want to be as inclusive as possible and anyone with a passion for mindfulness in education can join our monthly Zoom meetings and co-create our path forward. The Educating Mindfully Conference is three full days with a unique focus for each day on: mentoring, resources, and training. In addition to our annual conference, our nonprofit connects educators with those three essentials through local chapters. One of our 2019 goals is to get a chapter started in each state. Another goal is to attract funders so that we can connect school communities with financial resources through grants and scholarships. Tracy: Mindful teaching to me means setting an intention and checking in with your breath, body, and emotional state before each lesson segment or throughout the day. You have your lesson planned in detail, but when you are in that present moment flow, you can easily make adjustments to the plan and respond wisely to anything that arises. It’s also about showing your vulnerability; notice and embrace your non-mindful moments and share them with your students. A good laugh at yourself goes a long way for building relationships! I love the visualization I learned in my Mindful Schools training about being a translucent mountain in class: ground your nervous system with slow, deep breaths to become a solid container of safety and peace for the class (mountain) and let nothing that happens in class ‘stick’ to you or be taken personally (translucence). 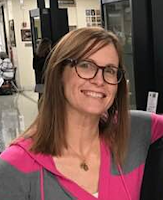 Catharine: You facilitate Family Mindfulness Nights at local schools, and COSEM encourages all educators and students to “Commit to 1%” and start their school day by practicing mindfulness together for 10 minutes (approximately 1% of our waking day). What are the benefits of adults and kids practicing mindfulness together? Tracy: Teachers and students are equally stressed these days from the basics of modern living; then add on trauma that some have faced and adverse life events that we all have faced and you have a recipe for teacher burnout, academic failure or much worse. For me, I made it through a year of collegiate gymnastics and then crashed emotionally and trudged through getting my engineering degree; my adrenals and hormone levels were beyond toast by the time I tried to start a family. On the outside I appeared happy and successful, but I was just trying to make it through each day. For many, the crash happens in other ways and much sooner in life. Parents, teachers, and kids ALL need the benefits of mindfulness to thrive so it makes sense to learn and practice together. Beyond personal benefits, it bonds those practicing together in a special way, especially when you take the time after practicing to reflect together about your experience.